While trans fat-free oils are mandatory for cooking in New York City restaurants, a spot check by a health advocacy group showed a typical large order of French fries from Burger King and Wendy's in Manhattan still holds more than the maximum daily recommended trans fat intake - in one case, almost double the amount. "Burger King and Wendy's are really deceiving customers with the public statements they've made about trans fat, which don't tell the whole story," said Michael Jacobson, executive director of the non-profit Center for Science in the Public Interest, in releasing the results Thursday. The American Heart Association recommends a daily intake of no more than 2 grams of trans fat. The center was quick to observe the readings did not mean the fast-food restaurants were ignoring the city ban - the first of its kind in the nation. Instead, the amounts recorded indicated the companies were using trans fat oils in frying the potatoes at a factory before delivery, according to the center. The potatoes are fried again at the restaurant. Burger King, in response to the random study, stressed that its fries are in compliance with the city's new guidelines. "We were in compliance for the deadline in New York, and working toward a move to a totally trans-fat-free system," said a Burger King statement. Wendy's, in an e-mailed response, said differences in the trans fat content could result from a number of factors. "Variations in french fries can be caused by potato seasonality; by employees adding a few fries too many to a serving, or a few less; and variances in cooking oil rotation," the company statement said. Wendy's also conducts its own testing at regular intervals, according to the statement, and posts the results on its Web site. The Washington-based center offered high praise to McDonald's, for for low trans fat scores. 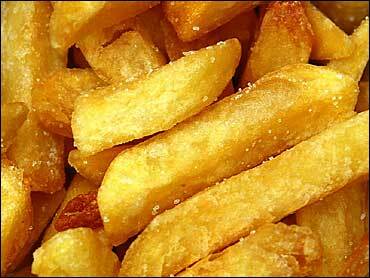 The fast-food giant delivered fries with just .2 grams of trans fat per serving, according to the laboratory tests. "McDonald's has proven that restaurants can truly eliminate artificial trans-fats," Jacobson said.